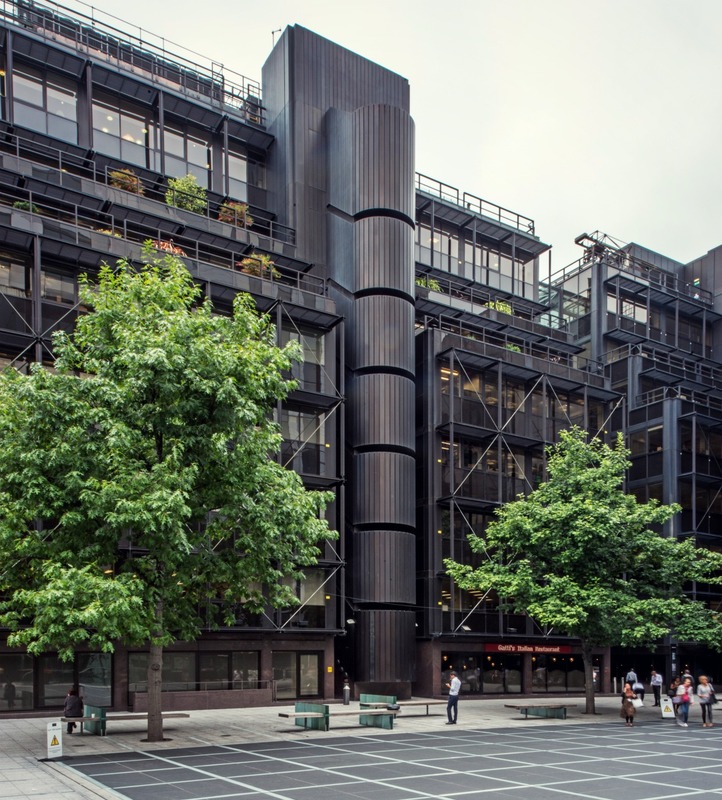 Following an English Heritage project to assess commercial buildings from 1964 to 1984, the work of leading modern architects has been celebrated today with the listing of 14 of the finest post-war office buildings in England. 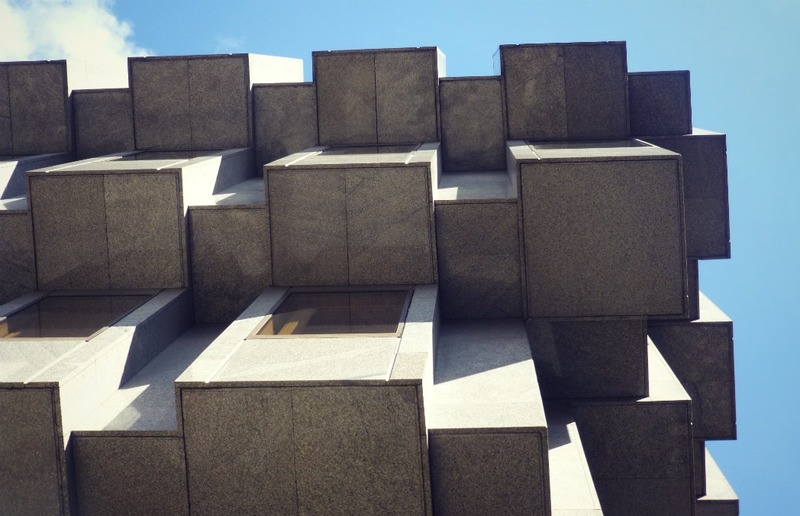 The first building to use the new technique of glass-fibre reinforced cement, 30 Cannon Street was designed by Whinney, Son & Austen Hall in the mid-70s. Its expressive and elegant design looks almost sculptural, and the building has stylistic affinities with the nearby Victorian commercial architecture of Queen Victoria Street, while giving the City a distinctly modern twist. 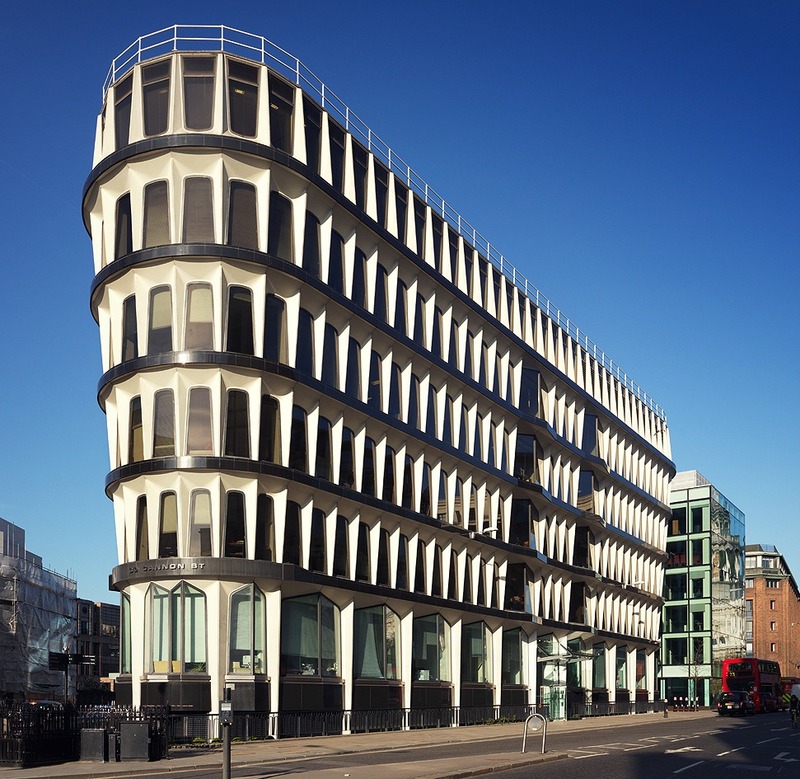 1 Finsbury Avenue, designed by Peter Foggo of Arup Associates, set new standards for commercial offices, with its IT-friendly planning, landscaped terraces, and meticulous attention to detail. It forms the first and finest element of Broadgate, a major new commercial quarter in the City. This unusual and distinctive 70s office secured Arup Associates’ reputation as one of the most innovative teams of architects and structural engineers working in England at the time. 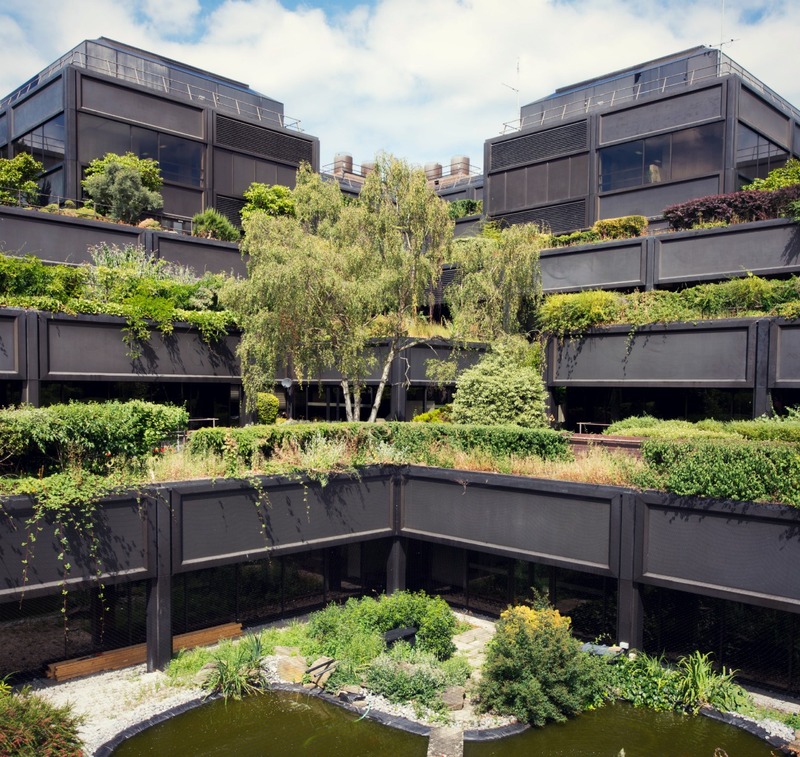 The spectacular series of cascading terraces, known locally as the ‘Hanging Gardens of Basingstoke’, were landscaped by James Russell, the noted garden designer. Arup Associates’ ingenious design integrates structure, services and workspaces, maximising the building’s flexibility and long-term sustainability. Built for Lloyd’s of London it was hailed by the Architects’ Journal as ‘powerful outside and beautiful inside’ and it continues to work well in its new guise as local authority offices. The aptly named Space House is an icon of the 1960s commercial property boom. 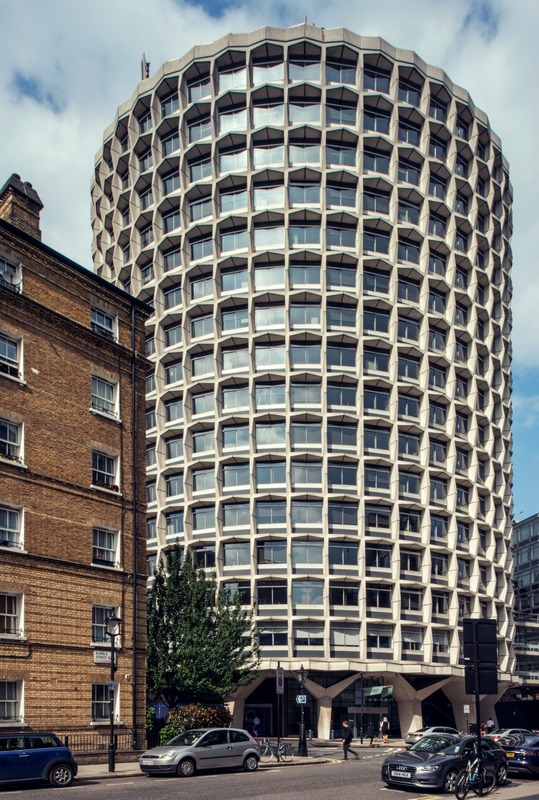 Designed by George Marsh of Richard Seifert & Partners, its striking cylindrical shape is defined by chunky concrete exterior, much like the practice’s other listed building – Centre Point – and shows how intriguing a speculative office block could be. 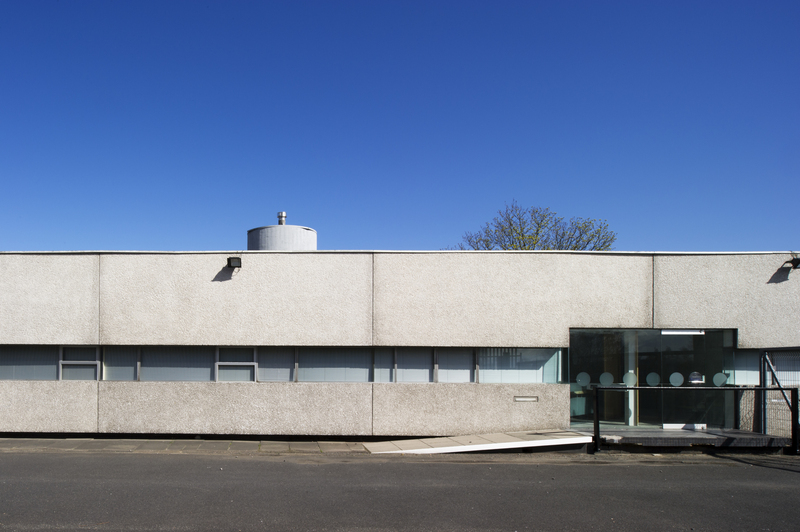 This is an elegant building with clean crisp lines and sharp detailing, designed by one of the most important post-war regional firms in England, Ryder & Yates for their own use. The single shared workspace demonstrates the practice’s multi-disciplinary philosophy, where architects, engineers, designers and landscape architects could collaborate. 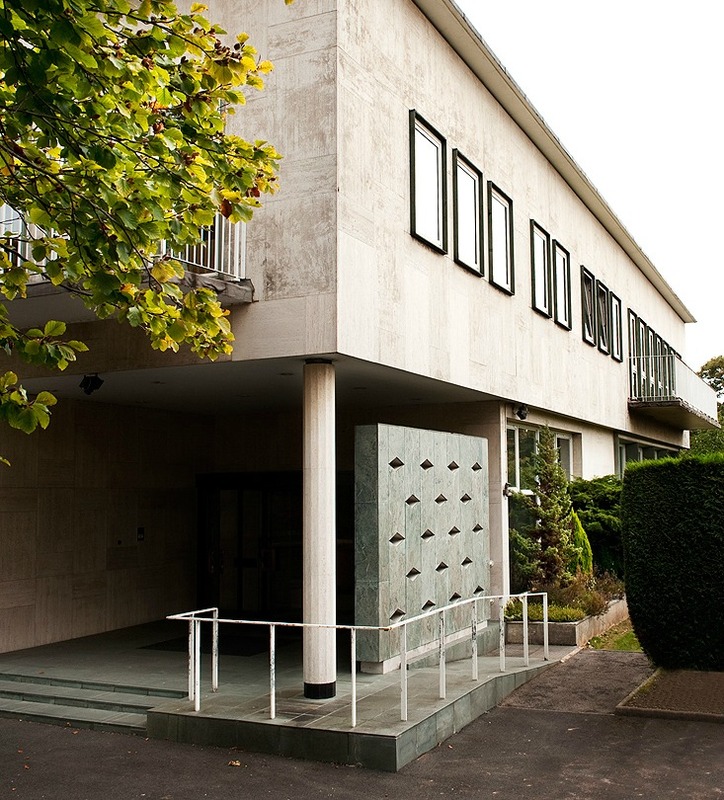 Its modernist single-storey pavilion form displays the influence of Le Corbusier and Lubetkin on Ryder & Yates’ work. 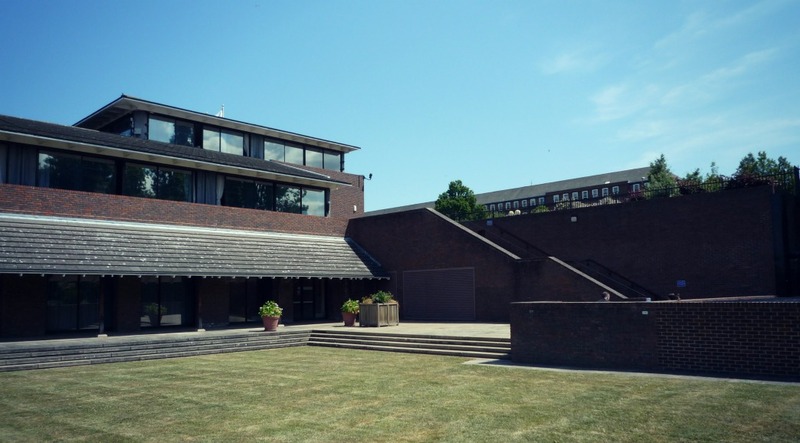 MEA House was the first office purpose-built to house multiple voluntary organisations under one roof, demonstrating the growing social relevance of the ‘third sector’. Designed in the early 70s by Ryder and Yates, its unique, innovative design dispenses with the need for columns, instead suspending the building slabs from deep beams within. Brown Shipley, in the heart of the City, shows how modern architecture could find inspiration in the Victorian past and create a harmonious addition. The opulent bronze enrichment of sculpted doors and railings by John Poole demonstrates how art could contribute to commissions like this. A former Bank of England regional headquarters building, Bank House is the most architecturally adventurous and accomplished example of the Bank of England’s 1960s building programme. It showcases the Brutalist trend towards powerfully-sculpted geometric volumes which proclaim the fortress-like strength that the Bank demanded. 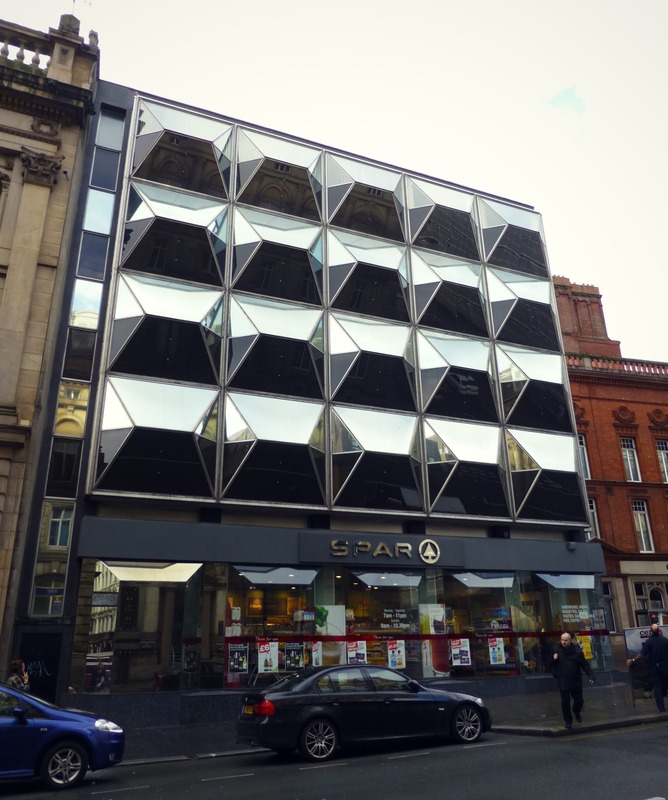 Bringing fun and diversity to the streetscape, the former Midland Bank showcases late 1960s ‘pop architecture’. It was designed by Raymond Fletcher of Bradshaw, Rowse & Harker, a leading local firm. 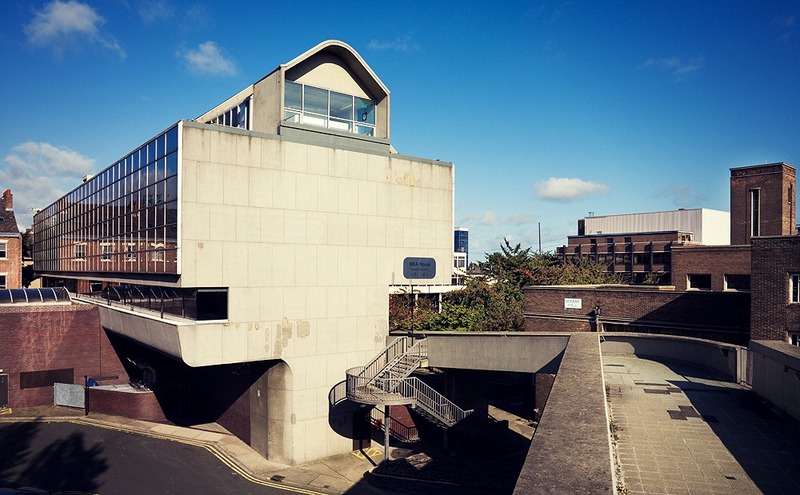 Designed in the 1950s by the noted Birmingham architect John Madin for the Engineering and Allied Employer’s Federation, his was a ground-breaking industrial relations building, cleverly planned to ease employer and Trade Union encounters. It therefore embodies one of the leading themes of the 20th century’s social history. This impressive twenty-eight storey office-block is carefully detailed. Designed under George Marsh of Richard Seifert & Partners (like Centre Point and Space House in London), its curved shape, reminiscent of a boomerang, and razor-sharp pre-cast concrete panels lends lightness and movement to this tall and slender building in the heart of the city. Arup Associate’s design for this low-energy, ‘campus’-style building on the edge of Bristol is distinguished by a sophisticated environmental design and high quality natural materials. The building sits comfortably within its green-belt setting, enhanced by a mature landscaping scheme. 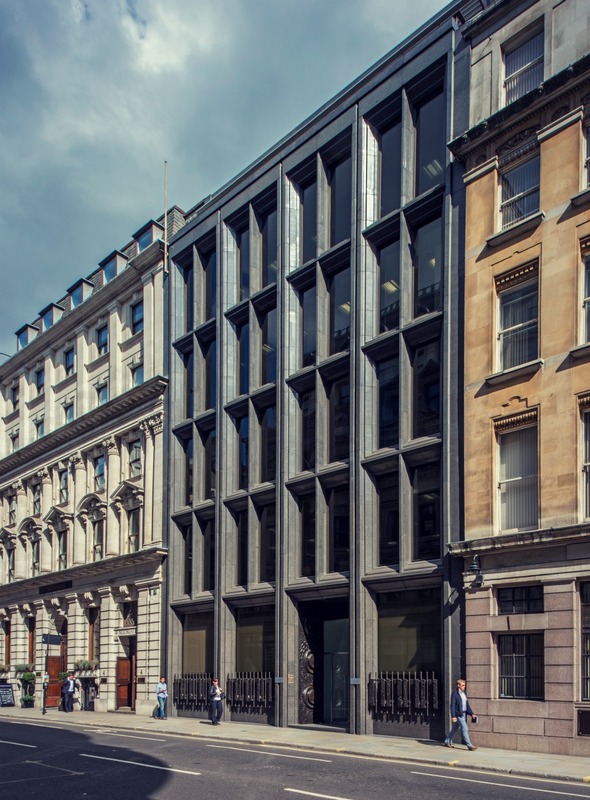 A seminal early work by Foster & Partners, world-renowned for buildings such as ‘The Gherkin’, Lynx House is a flexible, highly-serviced workspace within a rectangular glass shell. 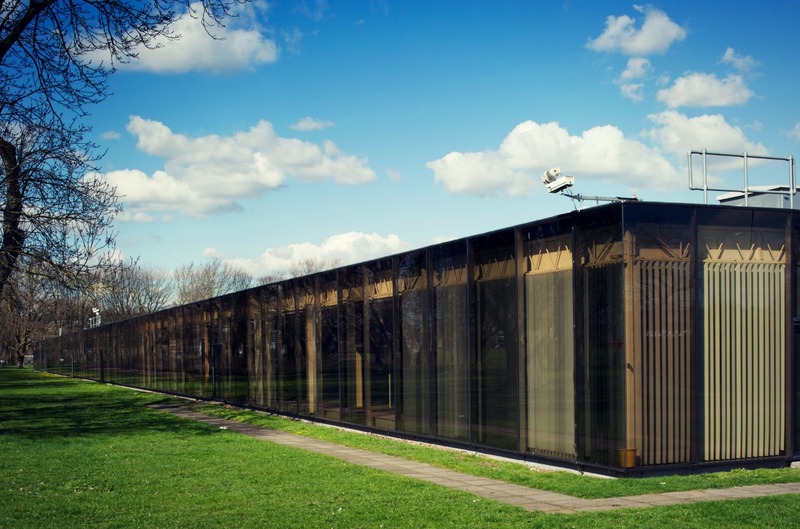 It was given an award by the Royal Institute of British Architecture for its ‘sheer professional competence’. The brief sought a structure designed to last just a few years, but Foster showed how a more enduring building capable of being altered could be built with the same budget. Office buildings shape the face of our cities and these listings have ensured that this area of architectural achievement is recognised for future generations. Listing helps the nation acknowledge and understand its shared history. It marks and celebrates a building’s special architectural and historic interest, and also brings it under the consideration of the planning system so that some thought will be given to its future when change is underway. Hi, great article. The Former Office of Ryder and Yates is in Killingworth not Killingsworth. Thanks for that. We’ve made the edit to Killingworth. Omission! Tower 42 – formerly NatWest Tower, the first skyscraper in the City of London. How can Space House and the Midland bank building get on this list? These photos show just how badly they fit with their neighbours. I though EH was supposed to protect the built environment from such out-of-character additions. Space House is great but in totally the wrong place, the Midland Bank is just an eyesore. Because if everything was made to “fit” it would de value the neighbouring buildings by being a poor pastiche. You can have poor copy after poor copy or a juxtapostion which makes both buildings stand out. How about the wonderful new library building in Rochdale? I have been interested in Richard Seifert since I was 11 and found an out of print ‘Goodbye London’ (1973) by C Brooker and C Lycett Green. I now love many of his buildings and wish more than three were listed. 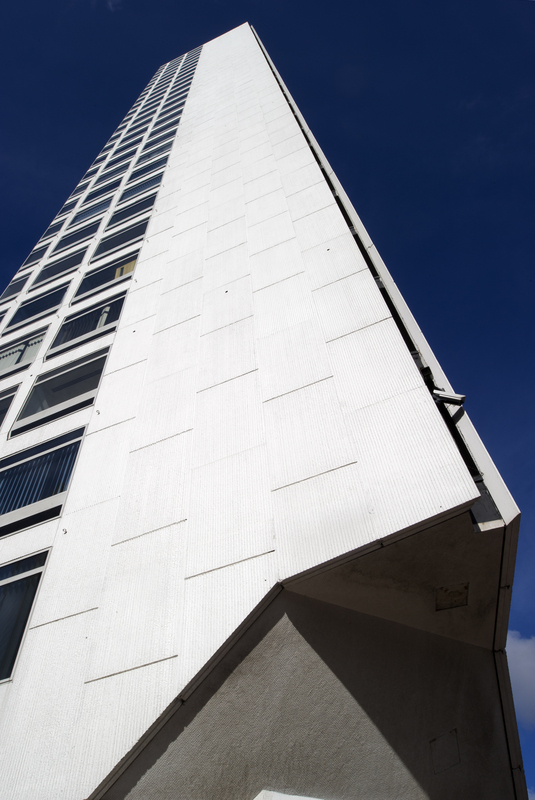 Sad that NatWest Tower was refused listing, my favourite building by him, thankfully uneconomical to demolish. The loss of Drapers Gardens is a real loss, and the new Euston may go. The National Sound Archive recordings are very interesting, Seifert was influenced early in life by the Wren churches of London. See link above.